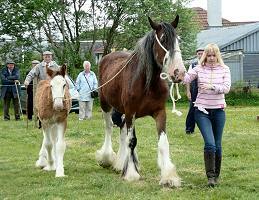 Lesmahagow Farmers' Society organises an annual show scheduled for the last Saturday in May. For more details, see their website. This page allows access to photographs of the event from 2009. The weather was overcast and cool for the start of the Show, but after midday the sun came out and it was warm, so much so that the sales of ice-creams went up exponentially. The Show was a great success with both quality and quantity in the entries to the classes. The Horse and Pony Section introduced showjumping in the afternoon for the first time. These series of pictures show some of the events. Despite the unseasonably chilly and wet weather in the surrounding days, the sun shone on Saturday 30th May, making 2015¹s Lesmahagow Show a great success, with a strong turnout of exhibitors and spectators alike. Again warm, sunny weather made a great Show with good attendance of both exhibitors and public. This was the second year for the poultry and waterfowl show which was even bigger and better. Bright warm sunshine helped make the 2013 Show a great success. This was the first year for a poultry and waterfowl show which attracted over 100 entries. More pictures (Tug of War, Industrial Section, Sheep Shearing, Dog Show, Poultry and Waterfowl Section, etc). The 2012 Show was a great success with a large turnout (over 3500), double that for the 2011 Show. The weather (in contrast to the preceding 2011 Show) was hot and sunny allievated by a gentle breeze. These series of pictures show the Champion of Champions and other events. Despite very wet conditions, the 2011 Lesmahagow Show went ahead successfully. There were periods of sunshine interspersed with heavy showers and hail. 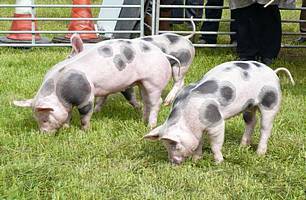 This was the first year that there had been a Pigs section; in fact, it was the first time there had been Pig Judging in an agricultural show in Scotland for 30 years. As before, there was especial interest in the Texel and Beltex sheep classes. These series of pictures show the Champion of Champions and other events. 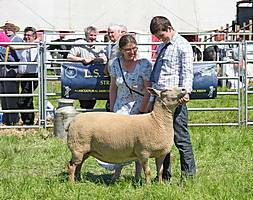 Despite threatening weather, the 2010 Lesmahagow Show, held at Langside Farm, Brocketsbrae, was very successful. The standard of entries in all classes was high with especial interest in the Texel and Beltex sheep classes. These series of pictures show the Champion of Champions and other events. 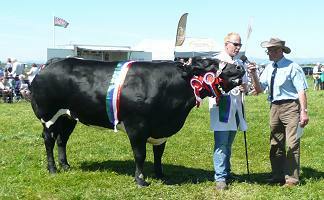 On a warm sunny day in May 2009, the biggest ever Lesmahagow Show so far was held at Langside Farm, Brocketsbrae. This series of pictures shows some of the events at the Show, the cattle, sheep and Clydesdale horse judging; the tractor parade; the sheep shearing competition and the horse and pony games.